In case you’ve been under a rock, or perhaps on vacation, you may have missed that Toni Wilen has a proof of concept PPC emulation working on WinUAE. It’s just enough to run AmigaOS 4.1 Classic. The current PPC Emulator is not JIT, so it is rather slow – even on a fast PC, and you can’t use any of the WinUAE extensions. Also, several critical PowerPC instructions are missing, so it is prone to some crashes. Even so, it is an amazing accomplishment. It also works with PowerUP and WarpUP/WarpOS PPC apps under AmigaOS 3.9. I gather Toni Wilen will look into getting the more advanced, QEMU PPC emulation core into WinUAE, which should provide greater compatibility and speed. Timeframe is unknown. 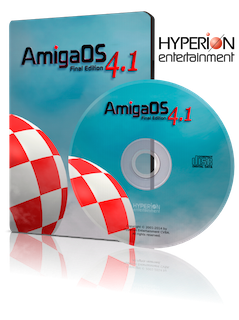 Check out all the details over at the Support.WinUAE forum on English Amiga Board. RDesktop 1.6 for MorphOS now available! A fresh new port of rdesktop 1.6 is now available, compiled for MorphOS! Many thanks to Michał Żukowski for the port! We highly recommend you to use this version if you are using MorphOS! Conversion from/to local codepage to UTF16-LE during disk access operations, user name, password etc. Enterprising user Lazar Zoltan has discovered a registry tweak to disable the Windows keys (and thus avoiding the “stuck” key problem while using RDesktop. This only disables the keys on Windows – not on the Amiga side. If you want the “quick and easy way” then just download and unzip the file from this link: Disable WinKey Registry. Once unzipped just double click to run. You may need to restart Windows.